Monkey King has a special place in our family tradition. 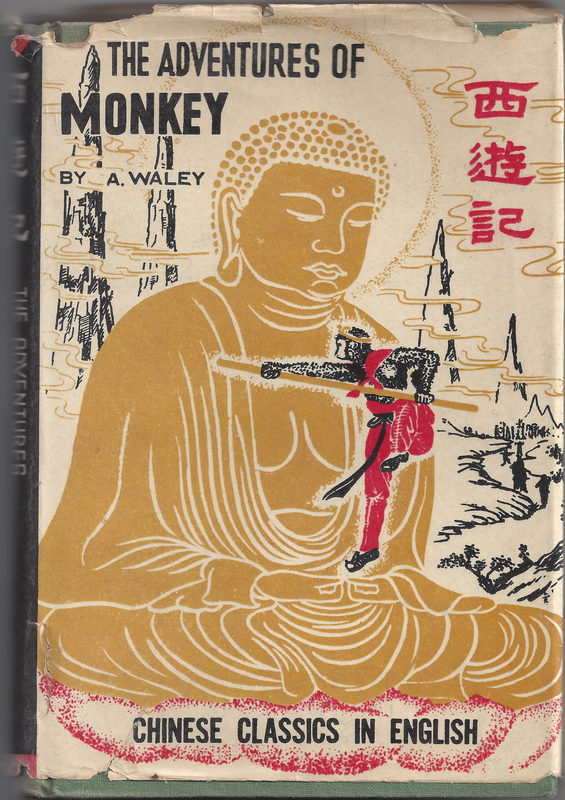 I first read The Adventure of Monkey by A Waley to my husband and daughter (when she was quite young) on one of our many driving vacations. Ever since then, he has been an endearing character for all of us. 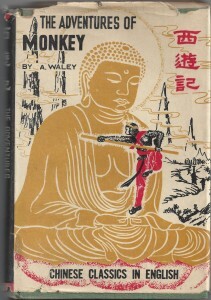 The Adventure of Monkey is a story about Monkey accompanying Tripitaka, aka Xuán Zàng, Xuarn Zahng 玄奘, along with Pigsy (a pig) and Sandy (a horse). His role was to protect Tripitaka, a monk traveling to the west (India) in order to bring back and translate Buddhist Sutras. This tale is a classic mixing of the supernatural with the historical. Xuan Zang was a real, historical person, who did, indeed, bring back and translate the Buddhist Sutra into Chinese, thereby greatly influencing the development of Buddhism in China. But this tale is only one of many about Monkey, who is a figure known to every Chinese and is particularly beloved by Chinese children. He is an extraordinary being who is highly intelligent, rebellious, and mischievous. He loves and faces adventures head-on. His tales involve run-ins with demons and monsters as well as gods and goddesses. As a sign of his mischievousness, we have only to look at how he attained immortality, which one would think should be earned by doing good or being exceptionally spiritual. Monkey’s immortality is due to his stealing the fruit from the Queen Mother of the West’s (Xī Wáng Mŭ, Xi Warng Muu 西王母) sacred garden! You can see why children—and adults—might love him. In many ways, he epitomizes our own complex nature. 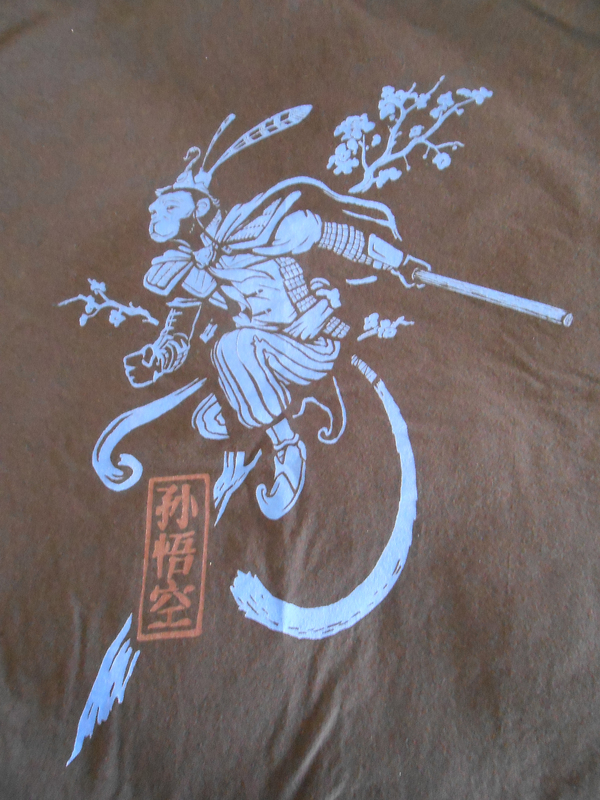 Sun Wukong possesses an immense amount of strength; he is able to lift his 13,500 jīn (7,960 kilograms (17,550 lb)) staff with ease. He is also extremely fast, able to travel 108,000 li (54,000 kilometres (34,000 mi)) in one somersault. Sun knows 72 transformations, which allow him to transform into various animals and objects; however, he is troubled in transforming into other forms, due to the accompanying incomplete transformation of his tail. Sun Wukong is a skilled fighter, capable of holding his own against the best warriors of heaven. Also, each of his hairs possess magical properties, capable of being transformed into clones of the Monkey King himself, and/or into various weapons, animals, and other objects. He also knows spells that can command wind, part water, conjure protective circles against demons, and freeze humans, demons, and gods alike. A couple of other sites to go to for more on Monkey King are http://people.wku.edu/haiwang.yuan/China/tales/monkey.html and http://www.pantheon.org/articles/s/sun_wu-kung.html. Thank you. Monkey King is an intriguing mythological character.